If you like your state government, not only do you get to keep it, Gov. Terry Branstad would like to give you more of it. Today, the governor gave his annual Condition of the State speech to a joint session of the General Assembly. In the speech, he laid out an agenda that focused on education, the state’s infrastructure, and quality-of-life projects. Another theme throughout the speech was the need for Republicans and Democrats to “work together” for the benefit of Iowans. • Biennial balanced budget – Branstad said his budget proposal is balanced and fits within the five-year budget projection, and fully funds property tax and education reform commitments. It increases education spending by $320 million, allows for a third year of in-state undergraduate tuition freezes at Iowa’s three Regent universities, and $63.2 million in funding for water quality projects over the next two fiscal years. The Fiscal Year 2016 budget asks for $7.32 billion, while the FY 2017 proposal is $7.5 billion. • Continued investment in infrastructure – Branstad noted there continues to be a need to upgrade infrastructure throughout the state. He pointed to the Battelle Report, which showed Iowa’s roads and bridges face an “uncertain future,” and that infrastructure is a prerequisite for economic development. While Branstad never mentioned Republican proposals to increase the state gas tax during the speech, he has suggested it as a means to fund infrastructure improvements. The Battelle Report, however, encourages the use of private-public partnerships as a means to fund repairs, improvements, and expansion of infrastructure. • Keeping college affordable – Branstad said he supports ongoing efforts to make the cost of education more affordable for Iowa students and their families, noting the average student loan debt for Iowa in 2013 was more than $29,000, ranking the state ninth worst in the U.S. He called on the legislature to freeze in-state undergraduate tuition for a third consecutive year, while increasing Iowa Tuition Grant funding for Iowans who attend independent colleges and universities in the state. He also challenged the Iowa Board of Regents to work with Iowa State University, the University of Iowa and the University of Northern Iowa to design $10,000 fixed-price degrees in some majors. He also asked the Regents and state universities to look at how to reduce the cost of some other degrees substantially. The governor further suggested the creation of tax credits for donations to student debt reduction organizations. The funds could then be earned by Iowans with college loan debt by performing community service projects. • IowaNEXT Plan – Branstad called upon the legislature to act on his plan for expanding recreational, cultural, entertainment and other opportunities for Iowans and their families. He called the creation of the IowaNext Plan a “a holistic approach to our state’s quality of life efforts” through the collaboration of state agencies and interested stakeholders. The four-step plan, which would consolidate the Vision Iowa Board and several other state agencies calls for the creation of an advisory commission to assist with coordinated efforts on quality of life projects funded through state, local and private sector dollars, as well as a fund from which the state will assist with funding for quality-of-life projects that have substantial local and private matching. The plan also calls for the creation of an IowaNEXT website, and a staff position within the Iowa Department of Cultural Affairs. • Connect Every Acre – Branstad said rural Iowa faces critical broadband needs, which will help smaller communities leverage economic growth as farmers turn to new data-driven technologies. Connect Every Acre is another part of the governor’s initiative to make Iowa the “most connected state in the Midwest” as measured by the TechNet State Broadband Index. Iowa currently ranks 34th nationally, and trails all other contiguous states in the rankings. The governor’s plan would fast-track the permitting process for any new broadband projects. and it would also, in part, offer grants to communication service providers to invest broadband access to farms, schools and rural communities. It would also provide complete tax exemption for all broadband infrastructure in place on or after July 1 of last year. • Center for Human Capital Enrichment – Branstad said Iowans’ work ethic and dedication were known throughout the world, yet there were skilled job openings throughout the state that go unfilled. He proposed the creation of two new entities to work with government and business stakeholders to align job skills training to meet both the needs of employers and Iowans. • Iowa Safe and Secure Communities Plan – Branstad said habitual domestic abuse offenders pose a “serious threat” to not only their victims, but to their communities, as well. He called for legislation to make a third or subsequent offense for domestic abuse to include a mandatory minimum sentence of one to three years in prison, as well as expanded use of electronic monitoring to prevent violation of protective orders. The full text of Branstad’s speech follows. To watch the speech, click here. Madam Lieutenant Governor, Madam President, Mr. Speaker, leaders, justices, judges, legislators, elected officials, distinguished guests, family, friends and fellow Iowans, good morning. It is my honor to stand before you today in this great chamber – in front of a joint session of the Iowa Legislature – to deliver the message that the condition of Iowa is strong. Our strength comes from working together and our joint commitment to prudent choices for a better Iowa. To the new members of the Legislature who are coming to Des Moines for the first time to serve their constituents back home, welcome. I also want to welcome returning legislators. You return to the Capitol after receiving a vote of confidence from your constituents. I am eager to continue working with you to serve our state. As we return for another legislative session, we return without a military veteran and dedicated public servant. Representative Dwayne Alons will be dearly missed in this great chamber. I know now, more than ever, the work we do here together matters. It matters in the lives of hardworking Iowa families and our Main Street businesses. It matters to farmers and farmland. It matters to public safety and our parks. It matters to Iowa children counting on us to give them a world-class education, who are now benefiting from the phase-in of the most extensive teacher leadership system in the nation. It matters to the veteran completing their tour of duty. Instead of worrying where they’re going to find a career after leaving the service, they’re comforted to know that Iowa has thousands of careers available for them right now through Home Base Iowa. It matters to the hard-working machinist on the line. Rather than thinking the industry had given up on them, they’re eager for the opportunity to sharpen their craft and demonstrate their skills through a National Career Readiness Certificate. It matters that we work together. These successes should serve as guideposts for a familiar journey of coming together to help Iowans create more jobs, live better lives and grow prosperity throughout our state. Ladies and Gentlemen, our work together has Iowa on the rise. We invested historically in our children’s future through transformational education reform. And we did it by working together. Together, during the 2014 legislative session, we worked across partisan lines to pass a historic Home Base Iowa package that attracts veterans leaving the military service to Iowa to fill the high-quality careers available here. Today, over 600 veterans have been matched with jobs in Iowa through our Home Base Iowa initiative. Eight cities and counties have become Home Base Iowa Communities, standing ready to embrace veterans and their families as they transition to civilian life and eight college campuses have earned the Home Base Iowa CHAMPS designation for their commitment to welcoming service members to campus. Already, our work together has resulted in over 24,000 jobs being posted on the Home Base Iowa jobs bank. Our work to pass Home Base Iowa is bringing new business to the state, as well. Earlier this month I met one of the owners of Capital Armament Company. A former United States Marine, he informed me that the company will be relocating from Minnesota to Sibley, Iowa, in part because of our Home Base Iowa program and friendly business environment. Simply put, by working together, we’ve ensured that veterans leaving the service have boundless opportunities to live, work and prosper in Iowa. Our work demonstrates that no veteran should have to worry about finding a job after sacrificing so much for our state and our nation. Our work, through the Iowa Apprenticeship and Job Training program, the Skilled Iowa Initiative and the National Career Readiness Certificate, among other initiatives, helped hard-working Iowans move forward. Unlike past years when tuition was raised by over 17 percent, we worked together to pass a tuition freeze for Iowa students at our Regents universities. Our work has put us on a bright, sustainable path. Our budget is balanced, our state maintains a budget surplus, our economic emergency accounts are fully funded and our unemployment rate is the 10th lowest in the nation. And we’ve done it together. With our continued progress, we must continue to be mindful of the prudent budgeting that brought us the opportunity to reinvest in our children and return taxpayers’ hard-earned money. Through careful management, we can continue to grow, even if we encounter choppy waters. We must continue following the lead of our fellow Iowans. Like the nearly 40 farmers who came together in Northwest Iowa in October with eight combines, six dump carts and a dozen trucks to help harvest the beans for their fallen friend. Together we can we can make our schools safer. We can continue implementing transformational education reform while passing new measures to protect our students from bullying and harassment in schools. Together we can strengthen our rural infrastructure by connecting every acre in Iowa to high-speed Internet. Better access to broadband means ensuring modern farming methods can flourish in all Iowa fields as part of a modern infrastructure. Strengthening our infrastructure also means we must come together and strengthen the roads and bridges that connect our farmers, schools and Main Street businesses to the world. We can make college more affordable and accessible for Iowans. We can renew our commitment to providing affordable world-class education at our Regents universities by offering select degrees for $10,000 and again freezing tuition for Iowa students. We can provide more assistance to Iowa students with financial needs attending our outstanding independent colleges and universities. Let’s continue to invest in our community colleges, including skilled training for Iowa workers. A better-trained workforce means better opportunities for Iowa families. Simply put, no position in our state should be left unfilled due to a lack of skilled workers. Together we can make Iowa the most transparent government in the land. We can offer Iowa taxpayers a new transparency portal, making state government more open, accessible and easier to navigate. Together, we can accomplish this forward-thinking plan of action. We have these opportunities to improve the quality of life in our state because together we made it possible. In the fall of 2014, Lieutenant Governor Reynolds, my wife Chris and I had the opportunity to visit Sioux City, North Linn and Marshalltown school districts to discuss the important topic of preventing bullying in Iowa schools. Students in these districts, and from around the state, have told their stories of learning being disrupted and feeling unsafe. What’s worse, we know some students are even being physically and emotionally harmed. Community leaders and parents shared that it was time for the state to act. Every day, children in Iowa schools are tormented by bullies. The bullies attack at school and on the Internet. They lurk not just in corners of the schoolhouse but also on Snapchat, Instagram, Facebook, Twitter, Yik Yak and through text messaging. Iowa common sense tells us that every child in Iowa deserves to go to school each and every day in a safe and respectful learning environment. They deserve a classroom and community that allows them to grow and flourish, not live in fear of when and where the bully will strike again. This is the year that we stand up to the bully. We can’t wait any longer. Please join Lt. Governor Reynolds, my wife Chris and me in standing up against bullying! 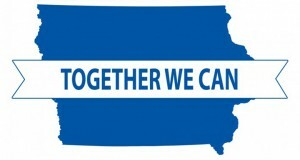 Together we can end bullying in Iowa, together we can protect our students and our schools from bullies. The Bully Free Iowa Act of 2015 that I propose today gives parents more information by requiring parental notification. However, I am proposing an extra layer of protection for students. This year’s anti-bullying legislation allows for an exception from notification if a bullied student and a school official believe that parental notification could lead to abuse, neglect or rejection. The legislation also launches a bullying prevention program, by empowering student mentors to take ownership of anti-bullying efforts in their schools. The bill allows a student, who changes schools due to bullying, to immediately participate in athletics. The legislation will also provide investigator training for schools. 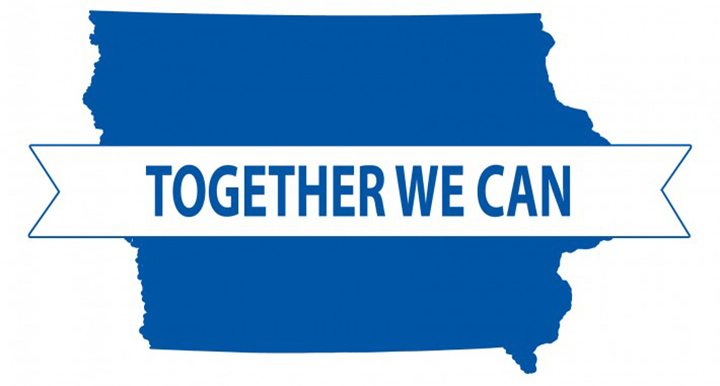 Together we can make 2015 the year Iowa acted to protect our children and grandchildren by ending bullying in schools. Moving Iowa forward also means ensuring our schools and communities stay safe and our families feel protected. It means we must do more to protect victims of domestic abuse. Now, domestic abusers can serve a fraction of their sentence and return to demonizing their victims. This is wrong. It is wrong for the victims and it is the wrong policy for the safety and wellbeing of Iowans. Let’s work together to pass additional measures ensuring victims do not live in fear of their abuser returning from prison long before the sentence is completed. Today, I propose legislation classifying anyone convicted of domestic abuse three times as a habitual offender. This classification would triple the mandatory minimum sentence. This legislation holds criminals accountable for their abuse, allows them ample time to rehabilitate and protects our communities. While victims and communities will be protected from habitual offenders, together we can protect vulnerable Iowans from individuals making criminal threats. Often times, Iowa courts order a threatening individual to stay away from a potential victim, but should the order be violated, the victim and authorities are not notified until after the fact. Sometimes, when it’s too late. Together we can give authorities and victims the power of knowing when an abuser is in close proximity. Together we can enact legislation that expands the use of GPS monitoring on dangerous domestic abusers. Together we can protect victims of domestic violence. Together we can work to end bullying in Iowa. We know our budget is sound and our books are balanced. We’ve done this together. We’ve passed historic tax relief aiding Main Street businesses and we’ve passed measures to increase the skills of Iowa workers. Those measures helped attract great companies creating high-quality careers for Iowans all over our state. Facebook just opened its first Iowa data center in Altoona and is already working on an expansion. Google is growing in Council Bluffs again, and Microsoft is expanding in West Des Moines. Cargill and CJ opened in Fort Dodge and are bringing even more good jobs to the region. In Sioux City, CF Industries will soon be expanding production of nitrogen fertilizer for Iowa’s farmers. The Iowa Fertilizer Plant under construction in Lee County will produce both nitrogen fertilizer and DEF to reduce pollution and increase mileage for diesel engines. Valent BioSciences, Kinze, Kemin, Sabre, Brownell’s and MidAmerican’s historic wind project: all are growing right here in Iowa. Across our state, though, farming operations still provide the lifeblood of our economy. Their continued success depends on their ability to connect. Not only connecting their equipment to the ground, but in this day and age it also means connecting their equipment to the Internet. Connecting with the global marketplace to sell their goods. Connecting to main streets across Iowa. The fabric of our state is woven together by the gravel roads and the interstate system, but in this day and age it also must be connected through access to broadband as well. This legislative session, let’s come together and pass legislation allowing rural Iowa to experience continued growth and connection to the rest of Iowa and the rest of the world. Together, let’s put partisan politics aside and give rural Iowa the broadband legislation that connects every acre and connects communities to the careers of the 21st century. Our Connect Every Acre plan focuses on providing more broadband to rural Iowa and encourages service providers to build out networks not just to the ending point, but to the rural communities in between. Between Davenport and Des Moines, between Mason City and Sioux City and all across Iowa, we are enriched by many rural communities. Let’s weave them together with the fiber of high-speed Internet, connecting every acre and covering our state with broadband Internet. Fostering expansion by creating the Iowa Farms, Schools and Communities Broadband Grant Program. Adopting these measures demonstrates an ongoing commitment to our state’s continued growth. With some of the most fertile land in the world, citizens with exceptional work ethic and a strong sense of community pride, rural Iowa has boundless opportunities. Together, we can adopt measures to connect every acre and give them yet another reason to believe their best days are ahead. Building a better Iowa means building Iowa for the future. It means investing in our state’s infrastructure. So let’s invest in broadband Internet. And, let’s also invest in Iowa’s roads and bridges. Over the past few years, rhetoric has trumped results when it has come to action for infrastructure funding for Iowa. A recently completed Battelle study demonstrates the need for us to take a hard look at adequate road funding. The study shows that without action, funding available for road and bridge maintenance will fall short of what is needed to remain competitive and, more importantly, safe. Without action, Iowa’s roads and bridges face an uncertain future. Our farmers will find it more difficult in delivering commodities to market. Business and industry will look elsewhere when considering where to invest and grow. As the study found, sound infrastructure remains a prerequisite for economic development. This is our opportunity to pave the road toward Iowa’s strong future. Together, we can find common ground and pass a bipartisan plan to fund the systems critical to our state’s vitality: Iowa’s roads and bridges, and our broadband infrastructure. Building an infrastructure as strong as the future that we all want for Iowa must be a bipartisan priority this legislative session! I’m confident we can find a solution together. We Iowans always do. Iowans’ exceptional work ethic, commitment and dedication are recognized across the country and around the world. Yet within our state today, skilled job openings are abundantly available and going unfilled. Last October, I toured Omaha Standard Palfinger in Council Bluffs. They are an international company that produces hoists, service cranes, lift gates and more. The Council Bluffs manufacturing facility was buzzing on the day I visited and the production floor was filled with welders and machinists. I saw their passion for their trade and their commitment to a superior product. For years, lift gates and service cranes had been produced overseas. Now, they’re being manufactured in America. They’re being produced in Council Bluffs, Iowa. After our tour, company leadership shared that they are eager to hire more workers in Council Bluffs, if only they could find those who have the right skills. These are long-term, high-paying careers for Iowans that should not be left open. Together, we can establish the Center for Human Capital Enrichment, a public-private partnership, dedicated to aligning education and training of Iowa workers. With a stronger workforce in place, we’ll bring more manufacturing and highly-skilled jobs to our state. Let’s lift up the Iowa worker. We can help companies like Omaha Standard Palfinger, who are ready to expand and fill more jobs in Iowa. Our state budget is tight, that is no secret. Iowans rightly expect predictability and stability in state government. They also rightly expect our state budget to reflect their priorities. The biennial budget I propose today is balanced, works within our five-year projections and still freezes tuition for Iowa students at our state universities for the third straight year! Freezing tuition for the third consecutive year is a bold step in providing an affordable higher education in Iowa. But our path doesn’t end there. That’s why we challenged Iowa’s Board of Regents to develop a plan that offers students a set of degrees that they can earn for $10,000. In addition, I am offering legislation creating the Iowa Student Debt Reorganization Tax Credit. This tax credit allows individuals to volunteer for worthy causes and in exchange have contributions made toward their student debt. We’ve worked together to freeze tuition, now let’s continue to take the right steps in making Iowa a leader in reducing student debt. Iowans rightly expect high-quality for the money they spend on education as well as a government that reflects our shared values. Together, we worked to increase transparency in government, making it as open and honest as the people of our great state. We created the Iowa Public Information Board to give the public a resource when seeking information from local and state government. I’m pleased to report the Public Information Board has responded to 643 cases in the last fiscal year. More and more, the inquiries are not complaints, but rather questions from policy makers about how they can be more transparent. The Iowa Public Information Board is making every layer of government more open. This year, I’m recommending that Iowa establish a Government Accountability Portal – a one-stop-shop for citizens seeking information. The portal, housed within the Public Information Board, will field requests and respond within one business day. As state employees, we are here to serve the taxpayers. Iowa can do more to improve government transparency. For many years, the people of Iowa, who fund state government, have been kept in the dark on personnel decisions because of a loophole in Iowa’s open records law. I was pleased last year when the Iowa House passed bipartisan legislation that would shine light on these personnel files. A substantiated offense, while a government employee is being paid by the taxpayers, should not be hidden in the shadows. Together, in the best interest of taxpayers, we can shine light on these records and make our state government even more open, honest and transparent. As I travel the state, I marvel at the endless beauty of our landscape. When I visit all 99 counties, it never ceases to amaze me what local communities are doing to continually improve their main streets and local quality of life. From the High Trestle Trail bridge near Madrid, to the revitalization of downtown Cedar Rapids. From the Lewis and Clark State Park along the banks of the Missouri River to the Historic Millwork District in Dubuque near the Mississippi River. Our land between two rivers offers our citizens a high quality of life and our visitors many attractions. But as Lt. Governor Reynolds and I continue to work to bring more business and industry to the state, we hear that companies are interested not only in our welcoming business climate, but also a high quality of life for their employees. This year, I am proposing IowaNEXT, a holistic plan for quality of life initiatives across the state. Let’s bring together state agencies that have a shared interest in quality of life initiatives and invest in our parks, trails, lakes and museums. The proposals outlined today will impact every Iowan. They will help to create jobs, protect students and families and open up our government. Like the old saying goes, many hands make light work. Remember back to June of last year. Torrential rains pummeled Northwest Iowa. In the Sioux County town of Rock Valley, the Rock River surged over its banks and into the streets and homes of residents. A few short weeks before RAGBRAI, citizens and community leaders wondered if they’d be able to recover. When I arrived in Rock Valley, I had little doubt. In a town of only 3,500, 1,700 people showed up to sandbag. Members of the town helped evacuate a local assisted living home. Emergency managers stayed up throughout the night to ensure the safety and wellbeing of locals, their homes and the town’s infrastructure. And when the cyclists of RAGBRAI from around the globe arrived in Rock Valley, the city was ready, because they worked together. When a challenge arrives, we Iowans get to work. We know that by working together we can find a solution to any problem. The 86th General Assembly is upon us. With it, comes an opportunity. Working together and moving forward is the Iowa Way. Let’s come together again to make our schools stronger and safer, our communities more connected, our families better protected, our workers better trained, our universities more affordable and our government the most transparent in the United States. Now is the time to get to work. Together, we can build a better Iowa. Thank you. God Bless You. And God Bless the State of Iowa.